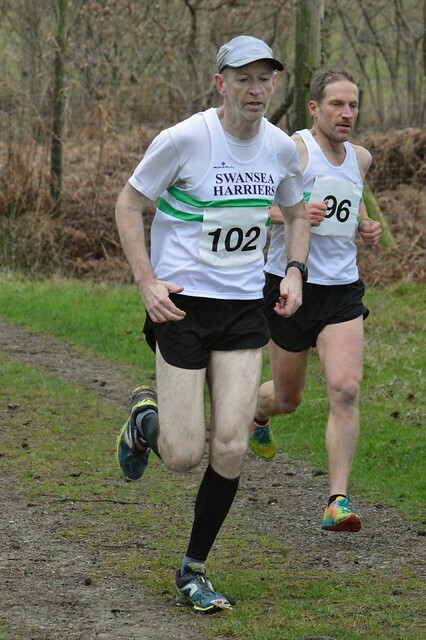 The Kenfig fixture seemed like a long time ago, so it was good to see some friends back on the circuit at Margam Park. It was cold enough outside, but the race HQ, the castle itself — a 19th century Tudor gothic mansion — was even colder. I changed quickly and hurried out to warm up. Inspecting the course it became evident the going would be varied. The first kilometre or so was on a well-surfaced road; but then, after a brief section of trail, there would be a boggy switchback climbing through a sequence of fields up to a rolling trail, from which a fast descent would bring you back to the road for a second lap. I ran alongside Paul Flynn until we hit the soft uphill at which point I pulled ahead. Royston Whitehouse came past me on that first climb but by the top I had my nose back in front. I went hard on the trail and by the start of the second lap was on my own, with Eamonn Kirk 100m in front and a similar gap on Roy behind. I worked hard to catch Eamonn but it wasn’t happening so I worked hard to stay ahead of Roy, aware of his fast finish. Oh yes, the finish: for some reason I hadn’t worked out where it was, and assumed it would be at the foot of the climb and in front of the mansion, as fine a finale as you could wish for. I was horrified when I realised this was not the case and that, once again, I was on tarmac with no end in sight. Could there even be a third lap? 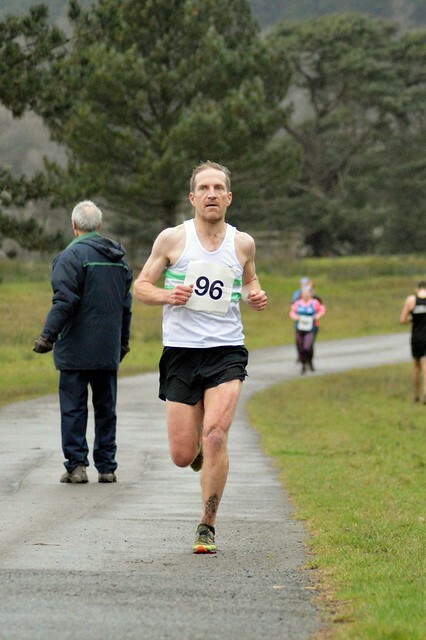 Luckily not, and I held it together until the line, to finish in 14th overall and first V50.